Have you enjoyed your Master Technicians experience? 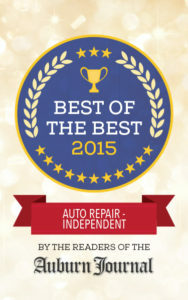 We believe we are the best Auto Repair Facility in Auburn, and we would like to spread the word. You may use the form below to share your experience and let others know what to expect. I started bringing my cars to Master Tech when I was in high school and had a Toyota Camry. 15 years later and I now have a 4Runner and continue bringing my cars to them. I feel like they care about me and my car. I know what services I need to get done and which ones are okay waiting. I have never felt as though I was sold something I didn’t need and I am always told what was done to my car. They don’t mind educating me or walking out to my car to talk me through the service. I recommend Master Tech if you have a Toyota or Honda. I have never been disappointed. I was at the end of a very long day, I came out to drive home and my car would not start. I tried many things and could not get it to turn over. I called Master Technicians and Stacy gave me the name and number of her tow truck contact and offered to pay for the ride to their shop. The top notch mechanics had thoroughly checked it out and a few hours later I was on my way. This shop is polite, thorough and incredibly well run. I have had many opportunities to get the simplest repair costing $60 through a major service up to $2900+. They have even hooked me up with a customer that was purchasing a newer model and I was able to buy a used car with great confidence because I knew it was well serviced. Thank you Master Technicians and I really appreciate that you were my HEROES again!!! Congratulations on receiving the “Best of the Best” award again. Top notch shop and extremely clean, extremely well trained ASE certified mechanics and service writers. The only shop in the area I trust on Major services with both of my Hondas. I’m tellin’ ya… this place is the best. I have brought my Toyota 4Runner here for service a few times and I have had the greatest experience. To start, I normally don’t plan well in advance so I normally call the day of to try to get my car into the shop. They have always been able to accommodate me within a few hours of my call. When I drop my car off, I am always greeted with a smile, handshake or some other form of pleasantry. The entire staff here is A+ when it comes to customer service and making you feel like family. I leave my car at Master Techs with an air of calm over me knowing that my vehicle is in good hands and that they will not try to sell me service/parts that I do not need. Whenever I pick up my car they walk me through everything that they did, when they would recommend for me to do future maintenance, and they also de-lime my front headlights. I cant say it enough: If you drive a Toyota or Honda then take it to Master Technicians. You will not find more kind and honest service anywhere. I was recommended to Master Tech in Auburn from a good friend in the area — I am very pleased with their work, in fact it exceeded my wildest expectations in terms of not only pricing being fair, and quick turn-around time, attention to detail, timely updates, and so much more. A pleasure working with Stacy and everyone at Master Tech – on my Civic repair, they use original Honda parts, and Master Tech go the extra mile to confirm nothing else of concern should be addressed at the same time. Having repaired my own vehicles 25+ years up until about 10 years ago, “trust” with any repair company has been very difficult for me personally — I trust Master Tech completely, I’m so glad Master Tech is there when I need them. I won’t be pulling my hair out in the future trying to find a shop for my vehicles! When I first contacted Master Tech, they advised I should immediately stop driving my vehicle with the specific problem I had. No such warning from the dealer — believe me it will be hard to go back for that recall to the dealer, knowing they recently let me walk out the door, and as well not warning me the problem my car had would result in extensive engine damage (overheating/warping) if I was to continue driving it. I highly recommend Master Tech and will continue to trust my “baby” to them not only for major repairs but periodic and preventative maintenance. Thank you Master Tech, you folks are the best!!! Just wanted to wish you Happy 20th Birthday and take the opportunity to say thank for taking care of all of our Toyotas..the truck, the Camry station wagon, and our 2 Corollas…for the last 13 years. We always feel confident that you are looking out for us! Thanks for everything and here is to another 20 years, and beyond! The first time I brought my Honda into Master Technicians was for an oil change. When Stacy started up the car, she immediately thought that something was wrong under the hood because it was making a very loud noise. I walked away with a diagnosis of a transmission problem. Thanks to that opinion, I pursued this loud noise and ended up with a new transmission, at no charge to me, from American Honda. Master Technician’s is the best place in Auburn to take your Honda, Toyota or Lexus. Their work is impeccable, the price is fair and their customer service is Phenomenal. If you don’t care to wait around they have sweet Diana to drive you back home or work, and she’ll pick you up as well. I feel whenever I have to take my car in I’m also visiting friends because that’s the way they treat you, like a friend……..and who doesn’t like to hear a business call you by your first name, not many do that. Give them a try, you won’t be disappointed, ask anyone in town! MT rocks! Dear Stacey and Everyone. Thank you for taking such great care of my car–this 2000 Corolla with it’s 173,000+ miles got 41.5 mpg on the trip to Boise! Wow, I’m pretty happy. Great work! We moved to Auburn three years ago and after extensive computer research we narrowed our choice to two shops. We visited both shops and after seeing how clean and professional both Master Tech’s facility and employees looked, it was a no brainer. We give Master Tech a 10 on a scale from 1 to 5!!!!! Fantastic Customer Service! They always take great care of us and our RX400h and SC300. This is easily the best auto repair place in Auburn. They only work on Toyotas and Hondas. They are honest and flexible and always do great work. Their prices are far lower than dealers. They remember my name every time I come in. They also have a shuttle to take you home if you can’t hang around or find a ride. Highly recommended!! I was refered by my Nephew Mark and his Grandma Joann. I drove from Rocklin and when I got to the shop everyone I came in contact with was super nice they take care of you like they would take care of themselves. I’m happy to be a Customer of theirs. I also have a 1990 Accord that loves the Master Techs…….they have been good to me, too. I’ve trusted the maintenance of my 1990 Honda Accord to Master Tech. Very Professional shop.